Wedding favours were a point of green decision making. M wasn’t sure we needed favours at all, but I liked the idea of people leaving with something that really reminded them who we are. The challenge with most wedding favours is the waste involved. Anything food related will probably come wrapped in plastic, something I really wanted to avoid, and we didn’t want anything that would just get thrown away. Inspired by Pinterest, our wedding favours were green – literally. What we thought would be most meaningful and representative of us would be to grow something that we could give to people to plant. It would be waste-free, and would produce food! We planted a forest of herb seedlings in our dimly lit kitchen for this purpose. But a series of mishaps got in the way. First of all, only half of the seeds germinated. Then, suffering from poor light, many of the baby seedlings stretched out and produced weak stems, and many of them just weren’t growing very fast. Then, disaster, I tipped over the seedling container, massacring over half of the seeds. It looked like herb seedlings weren’t in the cards! By chance, I had over-planted tomato seeds for ourselves in a fit of optimism (what do you mean, 30 plants won’t fit on our shared rooftop balcony? ), and they were coming up beautifully. We re-potted them in peat pots, that can be directly planted (no wasteful plastic pots), and these became our wedding favours. Of course, plants woudn’t work for everyone. Some of our guests came in from out of town, and bringing a plant home isn’t really feasible. So, for those guests, we put together packets of home-mixed tea, using fair-trade organic red rooibos from Gathering Place, home-grown (by a colleague) mint leaves, and organic chocolate chips to create some tasty, caffeine-free mint-chocolate tea. People loved them! Lots of people said they were excited about the tomatoes, and everyone loved in general that we had made our own favours. 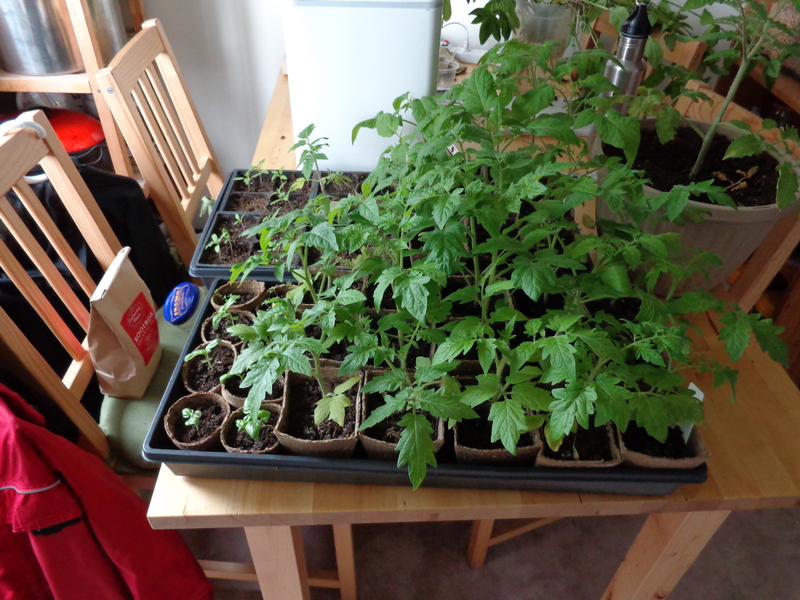 Although the favours were a bit of a stress factor right up until the end – repotting tomatoes the day before my wedding wasn’t exactly my ideal plan – they totally came off well. 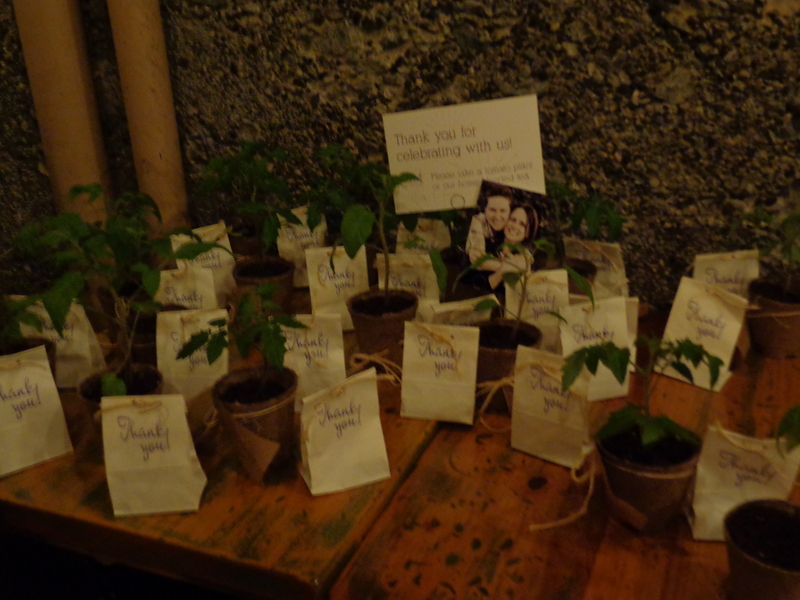 A lot of it was thanks to the last-minute hard work by our houseguests, who turned the seedlings into beautiful gifts with kraft paper tags. Whew. It’s been a long time since I’ve got myself together to write a blog post. Let me get back to it! If you’re anything like me, the holiday season can be a little bit of a nightmare. I love being able to spend time with my family – in fact, if that’s all Christmas was about, I would be thrilled! Food and family, that’s what I want! But that’s not really the way it works. I come from a long tradition of Christmas like it is on TV – lots of gifts, food, and general holiday excess. And it can honestly be more stressful for me to receive gifts than it is to give it, as I dread being left with a pile of unsustainably made, highly packaged items that I don’t need, no matter the good intentions that went into them. I’ve had to introduce things slowly into my family, and some changes have stuck, while others are still a battle. But I do have ways that you can make changes for things that are within your control. Reduce and reuse wrapping. Try newspaper or home-decorated recycled paper. Give homemade gifts. If you think about it far enough in advance, homemade items like candles are pretty easy and fun, or edibles like granola, party mix, or baking. For the planners and homesteaders, I love to give home canning or preserves. Like they say at Metro Vancouver, give memories, not garbage. Tickets to plays, concerts, comedy shows, or plans for experiences like taking someone out to dinner and a movie, some kind of lesson, bowling, or Science World. Give the gift of time. For the new mom, 10 hours of babysitting, and for a friend or colleague, offer to teach them something you know (i.e. Candlemaking, home canning). If you have any special skills like plumbing or carpentry, the gift practically makes itself! Many people travel long distances for the holidays to see friends and family, and though I usually recommend the staycation and avoiding flights where possible, family is key and if yours is far away, going home can be the most important part of your year. Invest in quality carbon offsets for your trip. Although there is much debate about the value of carbon offsetting, when flights are non-negotiable, they can be one small way to give back. friends and family to eat all the leftovers. Food is a major part of the holidays, so it’s an important piece to consider when thinking about the environmental impact. Where does your turkey come from, and what kind of life did it have? A lot can be said about the horrific conditions of factory farms. If you’re eating meat for the holidays, support local farmers, and invest in a free-range, organic turkey. Buy local – visit the Winter Farmer’s market for your dinner ingredients if you can, buy local organic wines and microbrew beers, and take advantage of seasonal goods for things like pumpkin or apple pie. Don’t make too much. Leftovers are great, but will it all be eaten? So much food goes to waste, and food should not be going to our landfills, taking up shrinking space and releasing greenhouse gases as they decompose inorganically. Dump whatever leftovers you can into a big pot of soup, and compost what’s left. National Lampoon’s Christmas Vacation – Too many lights? The holidays are a time when a lot more energy gets used. Reduce your impact on the electrical grid. Consider whether you really need holiday lights, and how many. Use less energy intensive lights, and when they’re broken and burnt out, dispose of them properly. Turn down the heat. Ever been to a holiday party where you could walk around in a tank top and shorts? With more people in the room, not to mention heat produced by cooking and baking, there is no need to crank the heat. Turn it down well before people come over, and encourage visitors to be comfortable in pants and sweaters, rather than dresses meant for summer weather. Use kitchen energy efficiently. Try to do as much baking in a row as possible, to reduce the amount of times you need to heat up the oven. Think ahead to plan for thawing items, to avoid use of the microwave. Keep drinks outdoors, and eliminate the need for the beer fridge. and family. Many charities count on donations received during the holidays for their yearly budget, so open your chequebook and be generous. Find out the favourite charity of a family member or friend, and make a donation in their name. If money is a problem, take some time to volunteer at a busy shelter or food bank, if they need it, or commit to volunteering in the New Year. I have found that by making as many small and large changes as possible, I can reduce my own holiday stress, as fewer things I encounter directly oppose my own values. Every year, I make more changes, and encourage my family to do the same, and small changes don’t detract from the overall holiday traditions. Less stress means a merrier Christmas!